Digital rights group Fight for the Future has announced plans to crowdfund billboards ahead of the 2018 election targeting Democratic Senators who vote to reauthorize mass government spying powers under Section 702 of the Foreign Intelligence Surveillance Act. The House voted 256-164 on Thursday to advance S. 139 which reauthorizes Section 702 for another 6 years without any meaningful reforms. 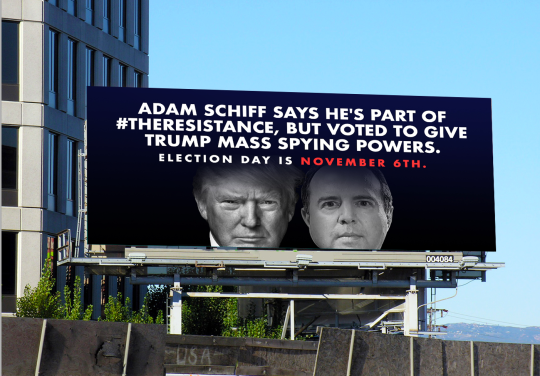 Fight for the Future plans to put up a billboard targeting Representative Adam Schiff, the ranking member of the House Intelligence Committee who opposed reinstating warrant protections for government surveillance programs that target Americans, and released a mock-up of what it might look like. The group is also promoting a chatbot tool allowing Internet users to contact their Senators by texting FREEDOM to 384-387. Fight for the Future plans to unleash similar crowdfunded billboards targeting Senate Democrats who vote to expand and codify mass surveillance on Tuesday. It would take 41 Senators to deny cloture and temporarily halt the vote. Fight for the Future has crowdfunded more than $50,000 to put up previous billboards surrounding Internet privacy rules and net neutrality, generating widespread attention.